Gahhhh!!!! 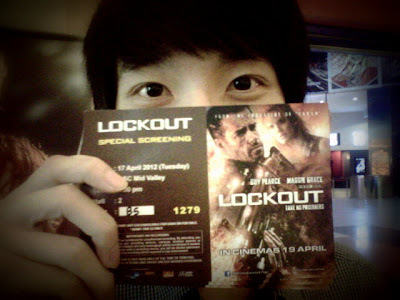 Le Boyfie got invited to the screening of Lockout. Tsk, such a lucky bunnai, why would he be that lucky? Here is a brief on how the story goes. Snow was an elite CIA agent that was accused to kill an important target during his mission. The enemies were after him and he had to ran away with a case. Apparently the case was important. Mean while, Emilie Warnock as the President's daughter visited to the world most secured prison, the MSA one. The MSA one was stationed at outerspace and being controlled to run on its orbit. Emilie was asked to interview one of the prisoners and unfortunately, with some random silly mistake went on, the spaceship was overtaken by the prisoners. Snow was then requested to save Emilie and at the same time, retrieved information from Mace (Snow's partner) about the case. Here's an apple, and a gun. To survive from 500 prisoners? I was cheated by the trailer. The CG effects looked so awesome in the trailer but ended up it was really bad. It is ridiculous to not be afraid when your alone in an outer spaceship with 500 dangerous prisoners. Emilie doesn't seem to be scared of the prisoners and she is really tough. Everything was about Snow, Snow and Snow. He was the hero in the movie and yeah, Guy Pearce really did a goob job on bringing out the personality of Snow: being a slacker in mission. I do love how Joseph Gilgun played his role as Hydell, a psychotic prisoner that released all the 500 prisoners. He added some colors to the movie with his actions. Ok, it was a prisoner spaceship right? Why were the prisoners were ALL guys but no women? Women? Where were you? At the kitchen? They don't sweat! As in all of them DON'T sweat neither do feel cold. Overall, I was quite upset with this movie as I thought the director, Luc Besson would come out something great as his previous movies were awesome. Well, you could spend your free time on this movie, but don't put too much hope into it. Throughout the movie I was this. Well, have fun. Now I can't wait for the Avengers, there's too much ads on it.